TrumpWatch, Day 684: “Key Cooperator” Flynn Spared Long Prison Sentence in Russia Investigation? 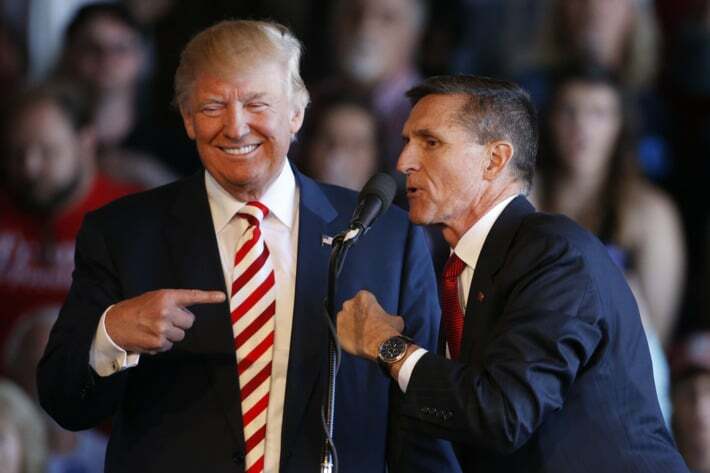 Michael Flynn, Donald Trump’s senior campaign aide and first National Security Advisor, should receive little or no prison time as a “key cooperator” with the Trump-Russia investigation, prosecutors said on Tuesday. Flynn pleaded guilty in December 2017 to lying to federal investigators. He had resigned in February 2017, after only 24 days as National Security Advisor, because of the claims. The former three-star general and head of the Defense Intelligence Agency lied over his contacts with Russian Ambassador Sergey Kislyak, including a December 2016 conversation — before Trump took office — which discussed the removal of the Obama Administration’s sanctions on Moscow. But, with the assurance of cooperation with Special Counsel Robert Mueller’s team, Flynn’s charges were reduced to one felony count carrying a prison sentence of up to five years. He sat for 19 interviews with Mueller’s office and other prosecutors and handed over documents and communications. Prosecutors wrote in a heavily-redacted sentencing recommendation memorandum, “His early cooperation was particularly valuable because he was one of the few people with long-term and first-hand insight” into Russia’s election interference and possible conspiracy with Trump associates. Prosecutors said Flynn’s military service of more than 33 years should be taken into account when he is sentenced on December 18. Donald Trump risked obstruction of justice by asking FBI Director James Comey to halt any investigation of Flynn. Trump subsequently fired Comey in May 2017, in a failed attempt to halt the Russia inquiry. Later this week, Mueller’s prosecutors will explain to a court how Trump’s former campaign manager Paul Manafort has violated a plea agreement on ten charges, and they will define the extent of cooperation with Trump’s former lawyer and fixer Michael Cohen, who has used his plea bargain to claim Trump’s criminal involvement, in payoffs to two women alleging sexual encounters, and the pursuit up to June 2016 of a Trump Tower in Moscow. Trump advisor Roger Stone said on Tuesday that he has invoked his 5th Amendment rights, in response to a request from Democratic investigators for the Senate Judiciary Committee to hand over documents and testimony. Stone is suspected of involvement with WikiLeaks founder Julian Assange to disseminate material, obtained in computer hacks by Russian military intelligence, damaging to Democrat nominee Hillary Clinton. Facing the extent of Cohen’s cooperation with Mueller, and the latest revelations from the Manafort and Cohen cases, Donald Trump’s team quickly whipped up a media campaign that there was no significance.